The Chislehurst Society has unveiled the next in our series of plaques to celebrate the lives of our residents of renown. 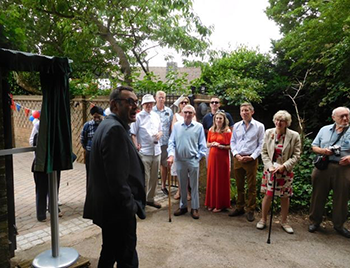 On Saturday 1st July we were honoured by the presence of Her Worshipful the Mayor, Cllr Kathy Bance and her consort at the home of John and Evelyn Barclay; Beechworth, on Orpington Road which was the last home of Richmal Crompton who wrote her final Just William books from this house. Local history group members were on hand with team leader Joanna Friel, who had organised the plaque ( it only took me four years to sort out!). We were joined by members of the Just William fan club lead by Bromley's heritage portfolio holder Cllr Nicholas Bennett. The great nephew, Eddie Ashbee and great neice, Kate Massey and her actor son Jonathon, of Richmal came all the way from Copenhagen and Blackheath respectively and we are looking forward to joining them again in 2019 as we commemorate 50 years since Richmal's passing. Perhaps we'll hold that event at Bromley High School were she once taught. Wetherspoons pub in Bromley, named after the author were very generous with liquid refreshment for the gathering. Miss Crompton is a real inspiration to me, as a polio victim she never let her disability get in her way of leading a full and purposeful life, inspiring a generation of young readers with her stories of William and Violet Elizabeth's adventures. I'm pleased to say none of us had to 'scream and scream until we were sick' yesterday! It was a wonderful occasion. 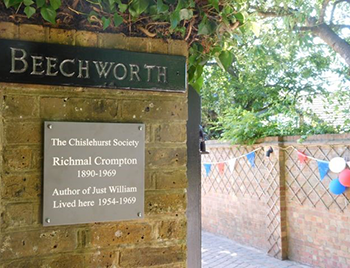 Walk along to St Paul's Cray Common, cared for by the Trustees of the Commons, by the front gates of Beechworth, tucked in behind the busy road, to view the Chislehurst Society plaque at your leisure and regale your kids about William and the Outlaws' escapades.